How long do all the Marvel actors have left on their contracts? 2019 marks a changing of the guard where the Marvel actors’ contracts are concerned. 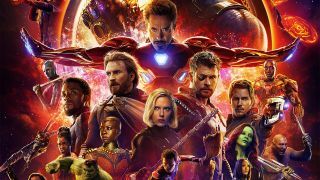 Avengers: Infinity War began the process of (apparently) eliminating certain Guardians of the Galaxy favourites from our screens – and even if they survive, Avengers 4: Endgame looks set to be the last hurrah for comrades such as Tony Stark, Thor, and Nick Fury (who himself was last seen going to pieces in a way-more-than metaphorical sense). Yup, turns out the Marvel actors’ contracts are as heartbreaking as the films. On which note, many spoilers ahead. As the longest running hero of the MCU, Downey Jr.'s contract has racked up so much ink it's gone from being a legal document to the stuff of legend. He was originally set to bow out of the MCU after five movies, ending with Avengers: Age of Ultron. His contract was then extended to include Captain America: Civil War, Infinity War, Avengers: Infinity War, and Avengers: Endgame. And sure enough, in 2017 he confirmed to news.com.au that Endgame will be his final MCU film: “I just want to hang up my jersey before it's embarrassing." Godspeed, Tony. The yin to Tony Stark's yang, Captain America has made it clear that he's only contracted for one more MCU movie: Avengers: Endgame. In fact Infinity War was the last entry in his initial six-film deal, but he was convinced to stay on by the notion that Infinity War and Endgame were effectively two parts of the same (colossal!) movie. Sure enough, he tweeted a final goodbye in October 2018: “Playing this role over the last 8 years has been an honor. To everyone in front of the camera, behind the camera, and in the audience, thank you for the memories!” Thank you too, Cap. Scar-Jo’s contractual terms with Marvel Studios have always been difficult to pin down – she previously told Collider that the specifics of her deal are constantly evolving: “My contract is kind of mutating, I guess… [it has] morphed to fit the demand of the character.” What we can say for certain is that, unlike Downey Jr. and Evans, she isn’t done yet. Avengers: Endgame will be the seventh movie in her MCU career, and definitely not the last. She’ll reportedly then earn $15 million to front the Black Widow spin-off, due in 2020. Last January Thor’s real-life alter-ego made it clear that Endgame fulfilled his eight-film contract and he wouldn’t be back – leaving behind a legacy that also includes Thor: The Dark World and Thor: Ragnarok. “I’m done. I won’t be playing the character again,” he told USA Today (via Gizmodo). Yet he appeared to re-open a closed door four months later, telling his Instagram followers that “we're going to keep trying to crank them out for you, if you let us” after the success of Infinity War. New contract coming, then? We can but hope. The Hulk, AKA Bruce Banner, AKA Mark Ruffalo, has wrapped five of his six contracted movies: The Avengers, Avengers: Age of Ultron, Thor: Ragnarok, Avengers: Infinity War, and Avengers: Endgame (the Iron Man 3 credits scene didn't count). That leaves one more. Who knows what it could be? Perhaps Marvel is leaving open the vague possibility of a Hulk solo movie somewhere down the line, despite Ruffalo confirming to IndieWire in the past that “Marvel and Universal famously don’t get along very well”. Although we were first introduced to Hawkeye in Thor, that didn't count toward the four movies on Jeremy Renner’s contract. The Avengers, Avengers: Age of Ultron, and Captain America: Civil War constitute the first three, and reports pegged Ant-Man and the Wasp as the fourth – until director Peyton Reed debunked them. Renner was also absent from Infinity War, but he’s back for Endgame – apparently in the guise of Ronin. That likely ends Renner’s original contract, but whispers of a solo Hawkeye movie suggest a new one may be in the works. Olsen began her Marvel journey with a large supporting role in Avengers: Age of Ultron. She fared much better than her onscreen sibling Quicksilver, earning herself a spot in the Earth's Mightiest Heroes' new line-up. And then it all, uh, turned to dust in Infinity War. There's never been any confirmed word on her contract, but somehow she is in Endgame despite the ‘unfortunate’ events of its predecessor. She’s also been heavily linked to upcoming TV show The Vision and Scarlet Witch, streaming via Disney+ – which, if accurate, would confirm her as a huge part of Marvel’s future plans. Fury’s disintegration in the Avengers: Infinity War post-credits scene suggests it’s adios for Samuel L. Jackson’s Avengers career – but the appearance was uncredited, and in fact he’s only completed seven of his nine contracted films. The eighth is Captain Marvel, coming later in 2019, along with Brie Larson. The ninth is not Avengers: Endgame, though: but Spider-Man: Far From Home. Then it’ll be bye-bye to the series’ lynchpin, who first appeared back in 2008’s Iron Man. What a run. Early in 2015 Bettany revealed that he had indeed put ink to paper for a Marvel Studios contract. He seemed rather excited about it too, expressing the freedom it gives him for other work in between: in short, Marvel's his steady gig. A gig which is very much up in the air following Infinity War, however. Vision’s death was the last before Thanos gathered all the Infinity Stones, suggesting a chance of resurrection – and Bettany has hinted that he may be back. Making those exact contract terms even more of an unknown quantity. Remember before Civil War came out and everyone was certain that we'd see either a hint or a mention of Bucky taking over as Captain America? Well, that's because a) it occurs in the comics and b) Sebastian Stan is signed up for NINE MOVIES. That doesn't happen because your mom bakes Marvel Studios boss Kevin Feige cookies - it means your character is going places. So far, Stan's knocked out four of those contracted films (The First Avenger was prior to signing), which leaves five flicks to come following Avengers: Endgame. Sweet.